Moping is excellent for making progress on stripey socks, so as soon as the sun returns, I’ll have some FO shots for you. In the meantime, take a gander at this washed-out photo that I’m not going to retake tonight. I bought this yarn back in March, with the intent of knitting complementary Christmas socks (cranberry and frost are the colorways), and the time has come to set that plan into motion. I think. Unless I decide to knit something else with them. Time will tell. I picked up the latest Robert Galbraith book, Lethal White, yesterday after voting, but didn’t have the energy to start it until tonight. I’m already enjoying it quite a bit! This is good, because Barbara Kingsolver’s Unsheltered, which is about two families 150 years apart facing tenuous futures with regards to their finances/employment/housing, is feeling much less enjoyable than it did a week ago. I have tremendous faith in Kingsolver, though, and know she will plot a path through this difficulty that will leave me feeling better about the situation than I do now. But when both books get too stressful, I’m ready to begin a re-read of The Prisoner of Azkaban, which has the added benefit of staying open in my lap while I knit. 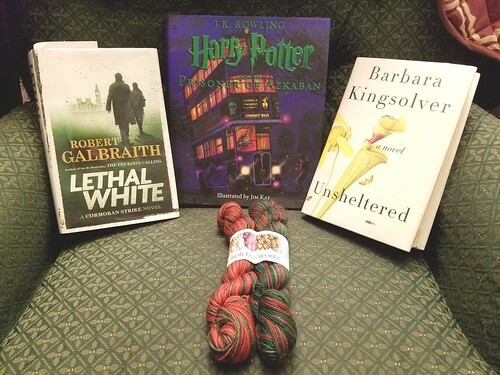 You can check out As Kat Knits to see what everyone else is reading and knitting as we head into the woolly months of the year. Category: books,knitting. There is/are 1 Comment.